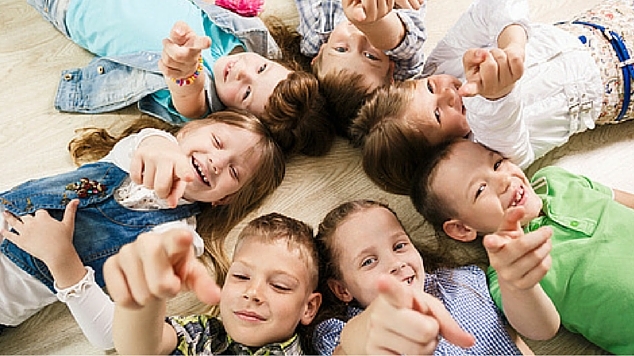 Sick of hearing “I’m bored!” from your older kids? Entertaining tweens indoors can be challenging, as they tend to turn their noses up at all suggestions that don’t involve technology! So if you’re looking for alternatives to plugged in activities, here are 25 of the best indoor games for kids aged 8-12 yrs, that will be sure to keep everyone happy! Sign up for our free newsletter, find us on facebook, Twitter, Instagram, YouTube and Pinterest. #1. What Am I Eating! My tween loves playing this game with his friends. They blindfold one person and raid the cupboards to find items for them to taste. 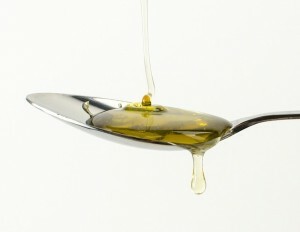 Things like honey, soy sauce, mustard, frozen pea, marshmallow etc. all work well. The blindfolded person must try and guess what they have been given to taste. Make sure you check for food allergies before playing this game. And it is probably best to supervise the food choices! A fun way to get the kids’ imaginations going. Each person gets a piece of paper and a pen/pencil. They write the first few lines of a story, fold the page until the last line or last few words of the previous person’s story is only visible, and pass the paper over the to next person, who writes the next few lines, and so on until the page comes back to the original author. Since each child cannot see all of the previous person’s story, they must write their lines based on one sentence/word. The resulting mixed-up stories will invariably bring much laughter. 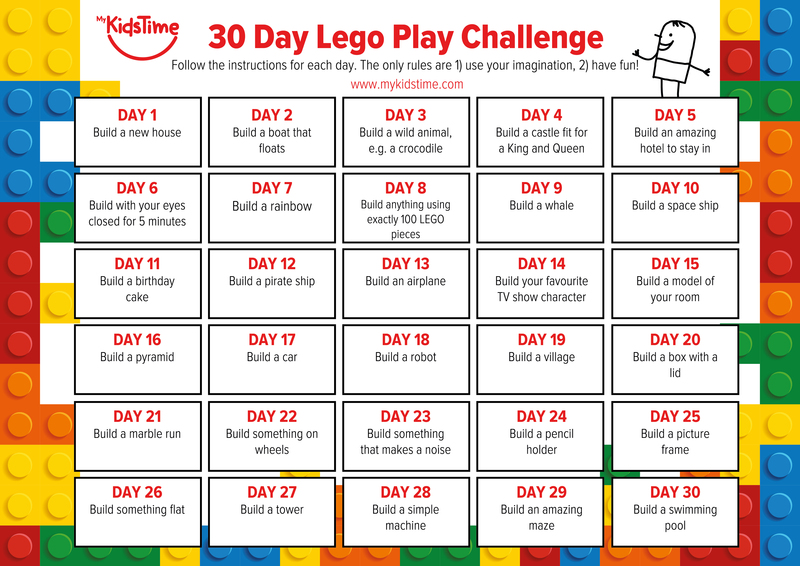 Download our fun free 30 Day LEGO Challenge! Challenge each other to talk for a minute each without using words beginning with an agreed letter of the alphabet. All you need to make Paper Aeroplanes is paper and pens for decorating. First fold your paper aeroplane and then the kids can draw the pilots at the front and the passengers looking out of the windows. Have Paper Aeroplane races and see whose gets furthest. This game is best done at night so that it’s dark when the lights are turned off. Have the kids sit in a circle and close their eyes. You gently tap one child on the shoulder, and they are the murderer. Everyone opens their eyes and you pick a detective. The detective leaves the room and waits outside until 5 seconds after they hear a scream. The lights are turned off and the other players must mix and mingle around the room. The murderer must tap their victim on the shoulder and whisper into their ear, I am the murderer and you are now dead. The victim must give a blood curdling scream and collapse to the floor. Everyone except the murderer, must stand still. Only the murderer can quietly move away, if they choose too. The detective enters the room 5 seconds after the scream and turns on the lights.The detective looks at the victim and starts to question everyone in order to identify the murderer. Only the murderer can tell a lie. Everyone else MUST tell the truth. Once the detective has decided who they think the murderer is they must touch the accused murderer on the shoulder and announce I am arresting you for the murder of John Smith (name the victim). If the detective is right then the murderer can confess. If the detective is wrong then the true murderer can reveal themselves. Build a bridge out of straws that is strong enough to hold 100 pennies. Or build a bridge out of pop sticks. Divide the room into two equal halves, and place the socks on the line in the middle (you could use masking tape to mark). Divide all the kids into two equal teams. When the game starts, the object of the game is to get as many socks onto the other teams side of the room before time is up. Team members must stay on their side of the room and toss the socks over to the other sides. 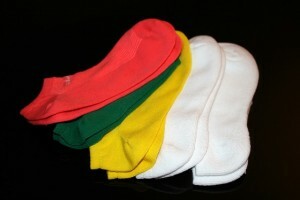 A team member cannot hold onto a sock for more than 10 seconds before having to throw it. You could also add in beach balls of varying sizes with the socks, for variety. Make your own secret code up and write a message to your friends that they have to decode. The Pigpen cipher uses symbols in place of the letters. Each child, or group of children, stands on a rug or cushion in the middle of the floor. This is their ‘flying carpet’ the only problem is, it is upside down! The object of this game is to turn the ‘flying carpet’ over without stepping off it. If you step on the floor you are out! More difficult than it sounds! Similar to Murder in the Dark, but with a winking murderer. Sit all the children in a circle and get them to close their eyes. Pick one player, or 2 if you have a really large group, to be the murderer, by touching them on their shoulder. Then get everyone to open their eyes and pick a detective. The ‘murderer’ must catch another players eye and wink quickly at them. If you are winked at you die, in a really dramatic fashion of course! The detective must try and guess who the murderer is. The murderer keeps winking at people until they are all out or they have been caught. Larry has successfully completed fourteen years of college and has earned seven degrees. He teaches Special Education in Connecticut's largest inner-city high school. In addition, Larry is a Teacher Consultant for the University of Connecticut's Connecticut Writing Project.